By Terray Sylvester | CANNON BALL, N.D. Opponents of the Dakota Access Pipeline who were pushed out of their protest camp this week have vowed to keep up efforts to stop the multibillion-dollar project and take the fight to other pipelines as well. The Oceti Sakowin camp in Cannon Ball, North Dakota, was cleared by law enforcement on Thursday and almost 50 people, many of them Native Americans and environmental activists, were arrested. The number of demonstrators had dwindled from the thousands who poured into the camp starting in August to oppose the pipeline that critics say threatens the water resources and sacred land of the Standing Rock Sioux Tribe. The tribe has said it intends to fight the pipeline in court. The 1,170-mile (1,885 km) line, built by Energy Transfer Partners LP, will move crude from the shale oilfields of North Dakota to Illinois en route to the Gulf of Mexico, where many U.S. refineries are located. Tonya Olsen, 46, an Ihanktonwan Sioux from Sioux Falls, South Dakota, who had lived at the camp for 3-1/2 months, said she was saddened by the eviction but proud of the protesters. She has moved to another nearby camp on Standing Rock Sioux Tribe reservation land, across the Cannon Ball River. “A lot of people will take what they’ve learned from this movement and take it to another one,” Olsen said. She may join a protest if one forms against the Keystone XL pipeline near the Lower Brulé Sioux Reservation in South Dakota, she added. Tom Goldtooth, a protest leader and executive director of the Indigenous Environmental Network, said the demonstrators’ hearts were not defeated. Many hope their fight against the project will spur similar protests targeting pipelines across the United States and Canada, particularly those routed near Native American land. “The embers are going to be carried all over the place,” said Forest Borie, 34, a protester from Tijuana, Mexico, who spent four months in North Dakota. “This is going to be a revolutionary year,” he added. Borie wants to go next to Canada to help the Unist’ot’en Native American Tribe in their long-running opposition to pipelines in British Columbia. Energy Transfer Partners, the Dallas-based company constructing the Dakota Access pipeline, is already facing pushback from a diverse base of opposition in Louisiana, where it is planning to expand its Bayou Bridge pipeline. Other projects mentioned by protesters as possible next stops include the Sabal Trail pipeline being built to transport natural gas from eastern Alabama to central Florida, and Energy Transfer Partners’ Trans-Pecos in West Texas. Sabal Trail is a joint project of Spectra Energy Corp, NextEra Energy Inc and Duke Energy Corp.
Another protest is focused on Plains All American Pipeline’s Diamond Pipeline, which will run from Cushing, Oklahoma, to Valero Energy Corp’s Memphis refinery in Tennessee. Anthony Gazotti, 47, from Denver, said he will stay on reservation land until he is forced out. Despite construction resuming on the Dakota pipeline, he said the protest was a success because it had raised awareness of pipeline issues nationwide. “It’s never been about just stopping that pipeline,” he said. June Sapiel, a 47-year-old member of the Penobscot Tribe in Penobscot, Maine, also rejected the idea that the protesters in North Dakota had failed. Cannon Ball – On November 20th at approximately 6PM CST over 100 Water Protectors from the Oceti Sakowin and Sacred Stone Camps mobilized to a nearby bridge to remove a barricade that was built by the Morton County Sheriff’s Department and the State of North Dakota. This barricade, built after law enforcement raided the 1851 treaty camp, not only restricts North Dakota residents from using the 1806 freely but also puts the community of Cannon Ball, the camps, and the Standing Rock Tribe at risk as emergency services are unable to use that highway. Water Protectors used a semi-truck to remove two burnt military trucks from the road and were successful at removing one truck from the bridge before police began to attack Water Protectors with tear gas, water canons, mace, rubber bullets, and sound cannons. 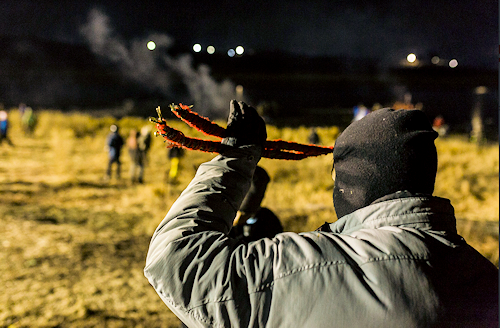 At 1:30am CST the Indigenous Rising Media team acquired an update from the Oceti Sakowin Medic team that nearly 200 people were injured, 12 people were hospitalized for head injuries, and one elder went into cardiac arrest at the front lines. 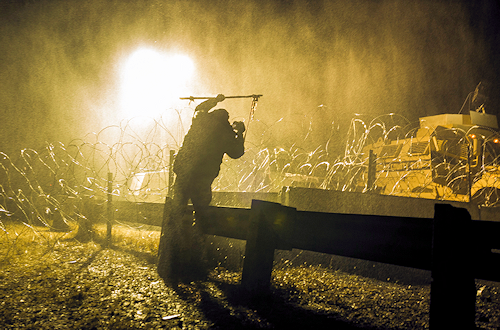 At this time, law enforcement was still firing rubber bullets and the water cannon at Water Protectors. About 500 Water protectors gathered at the peak of the non-violent direct action. “The North Dakota law enforcement are cowards. 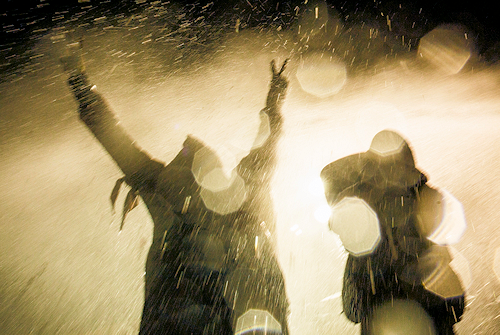 Those who are hired to protect citizens attacked peaceful water protectors with water cannons in freezing temperatures and targeted their weapons at people’s’ faces and heads. The Morton County Sheriff’s Department, the North Dakota State Patrol, and the Governor of North Dakota are committing crimes against humanity. They are accomplices with the Dakota Access Pipeline LLC and its parent company Energy Transfer Partners in a conspiracy to protect the corporation’s illegal activities. Anyone investing and bankrolling these companies are accomplices. If President Obama does nothing to stop this inhumane treatment of this country’s original inhabitants, he will become an accomplice. And there is no doubt that President Elect Donald Trump is already an accomplice as he is invested in DAPL”.